Discussion of recent developments in the field as well as nomenclature issues. According to the article, “Genetic genealogists, who are obtaining full-sequence mtDNA tests in increasing numbers, are in a position to provide a â€œbiased sampleâ€ for the study of the mutation rate in the coding region.” ... Click to read more! “However, solving the Buffett mystery illustrates how a stake in 23andMe is a good fit in Google’s portfolio. The one thing that blows me away here is that a simple spit test was enough to uproot a family tree deep enough to find an ancestral link before surnames were even around. ... Click to read more! It turns out that 23andMe isnâ€™t just a startup idea thatâ€™s waiting for technology to catch up.In 1999, Fortune Magazine posed the question, â€œAre Jimmy and Warren Buffett Related?â€This week, 23andMe revealed the long-awaited answer, which is that the two Buffetts â€“ well, letâ€™s save that for the end. 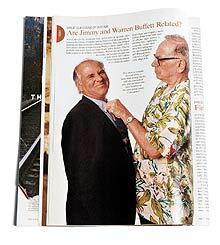 Apparently Warren Buffett (finance guru) and Jimmy Buffett (musician), have always wondered if they are related to each other, potentially through a common ancestor who lived in a penal colony in the South Pacific.Earlier this year Anne Wojcicki, the co-founder of 23andMe, asked Jimmy and Warren if they would submit DNA for analysis.According to Warren Buffettâ€™s assistant, he â€œjust kept spitting into a little receptacle, and then we FedExed it.Not very elegant.â€23andMe then did Y chromosome and mtDNA analysis of Warren and Jimmyâ€™s DNA. ... Click to read more! I believe that whole genome sequencing will have myriad uses. In the paper mentioned in Part III of the series (John A. Robertson, “The $1000 Genome: Ethical and Legal Issues in Whole Genome Sequencing of Individuals (pdf).” 2003 The American Journal of Bioethics 3(3):InFocus), Mr. Robertson suggests that demand for personal genome sequencing outside of the medical context could be quite limited. But that view might fail to take into account uses of genomic information other than identifying or predicting disease, such as the genetic genealogy setting. Very few could have predicted 10 years ago that thousands of genealogists would be submitting their DNA for limited sequencing as they are doing today. If information from whole genome sequencing can be used to analyze genealogy (which it surely will be), then this will create an entire niche that will increase commercial demand outside of the medical context. And this is only one such niche. There might be many many more, some of which will only develop after whole genome sequencing becomes economically available. ... Click to read more! As I mentioned recently, James Watson is about to be the first person to have his entire genomic information handed to him. According to this article in Today’s issue of the Observer, Watson “has decided to go ahead and have his entire genome put on the internet this week.” I’m not sure what the Observer used as its source – according to my research Watson hadn’t yet decided what he was going to do with the sequence. Update: A huge story from Newsweek states that Watson has decided to release his entire genome to a NIH database (minus the ApoE gene)! I hope this gets lots of media coverage. This is a HUGE moment for genetics, one that we will all look back on. And I have to admit, I am very jealous of Watson’s opportunity! Here’s a great article on the subject, well worth a read!Â Here are some highlights from the Observer article: ... Click to read more! In Part I and Part II of the “You and the $1000 Genome” series we examined the history of the Archon X PRIZE for Genomics and the success of the International HapMap Project. Today we’ll talk about some of the ethical issues associated with efficient and inexpensive genome sequencing. The value of whole genome sequencing will only be realized if individuals believe they have complete and legal control over their genetic information. I am greatly indebted to a thorough analysis of this issue by John A. Robertson at the University of Texas School of Law (“The $1000 Genome: Ethical and Legal Issues in Whole Genome Sequencing of Individuals (pdf).” 2003 The American Journal of Bioethics 3(3):InFocus). Note that this analysis is not intended to constitute answers to any of the ethical questions – it is only meant to be part of the discourse. ... Click to read more! In Part I of the “You and the $1000 Genome” series we examined the Archon X PRIZE for Genomics, a $10 million purse for the group that can sequence 100 genomes in 10 days for no more than $10,000/genome with an error rate below 0.001%. With today’s technology this goal is still a few years away. But do we need an entire genomic sequence to obtain all the relevant medical information that our DNA contains? After all, 99.9% of my DNA is exactly the same as everyone else’s! Why sequence that 99.9% over and over and over if the results are the same every time? Wouldn’t it be cheaper to just sequence and then decode the 0.1%? Sequencing that 0.1% is the goal of the International HapMap Project. HapMap stands for “Haplotype Map”, and those of you who are genetic genealogists will instantly recognize the importance of the word haplotype. The goal of the HapMap Project, begun in 2002, is to identify SNP groups (haplotypes) from a total of 270 individuals representing the Yoruba people of Nigeria, the Han Chinese in Beijing, the Japanese, and U.S. residents with northern and western European ancestry. The HapMap is essentially a catalog of all the common genetic variants in human beings. ... Click to read more! “Even though your body contains trillions of copies of your genome, you’ve likely never read any of it. Our goal is to connect you to the 23 paired volumes of your own genetic blueprint (plus your mitochondrial DNA), bringing you personal insight into ancestry, genealogy, and inherited traits. By connecting you to others, we can also help put your genome into the larger context of human commonality and diversity. ... Click to read more! In 2003 the J. Craig Venter Science Foundation announced a $500,000 Genomic Technology Prize that would be awarded to an the group whose technology significantly enhanced “the field of high throughput DNA sequencing by enabling a human genome to be sequenced for $1,000 or less.” The Foundation believed that crossing this threshold would enable the majority of individuals to afford genomic sequencing as part of medical treatment. ... Click to read more! In 2003, researchers from around the world released a paper that suggested that 8% of all Mongolian males have a common Y chromosome because they are the descendants of Genghis Khan (See â€œThe Genetic Legacy of the Mongols,â€ 2003, Zerjal, et. al., American Journal of Human Genetics, 72: 717-721).The researchers examined the Y chromosome variability of over 2000 people from different regions in Asia and discovered a grouping of closely related lines.The cluster is believed to have originated about 1,000 years ago in Mongolia and its distribution coincides with the boundaries of the Mongol Empire. Genghis Khanâ€™s empire (he ruled from 1206 â€“ 1227) stretched across Asia from the Pacific Ocean to the Caspian Sea and was reportedly extremely prolific.Khanâ€™s son Tushi had as many as 40 sons.His grandson Kublai Khan is reported to have had as many as 22 sons, and perhaps many more.Together this family may have as many as 16 million descendants alive in Asia today.It is extremely important to note that until DNA can be extracted from Khanâ€™s bones (which have never been found), there is no definitive proof that this Y chromosome cluster is actually descended from Genghis Khan. ... Click to read more!